We've had a bumper couple of weeks of rankings points but naturally as Formula One goes on its summer break, the activity and pointsworthy moments trail off. There's still a few drivers up to no good though, particularly the Red Bull boys who are showing off their holiday plans, the McLaren boys who have a few questions to answer, and Valtteri Bottas who reveals some very interesting things about himself! Do keep your eyes peeled for drivers up to exciting things whilst on their break, holiday snaps, a fashion faux pas, or just passing the time of day with fans. Let me know what you find out. +1 Fernando Alonso: Loving his extra-competitive nature in the McLaren version of Grill the Grid, won't listen to Stoffel that they're meant to be working together. +1 Stoffel Vandoorne: You can see that Stoffel has to put up with a lot partnering with Fernando Alonso, bless him. +1 Daniel Ricciardo: Not sure how much say they had in their summer accessories, but I'm loving the watermelon. +1 Max Verstappen: Not sure how much say they had in their summer accessories, but I'm loving the flamingo. +2 Fernando Alonso: Alonso being as excited as the rest of us about Robert Kubica's test day. 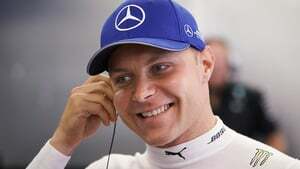 +2 Valtteri Bottas: I really love this Secret Life of post only for the line about the self-opening umbrella. Still chuckling about it now. +2 Lewis Hamilton: Spot of lawn mowing with not very much in the way of straight lines.